Tari Saman Aceh derived from Nanggroe Aceh Darussalam (NAD). The uniqueness of the dance of Aceh is raising its nimble, flexible, and lightweight. Dances of Aceh are generally accompanied by music that the source could be from musical instruments (tambourine) or members of the body of a dancer, such as passage of fingers, Pats of hand or Pats his chest. Tari Saman or Seudati is an example of the typical dances of Aceh that has been very popular in Indonesia even in the world. Saman dance has a unique movement since the movement displayed include hand movements, body, and head and done while sitting. 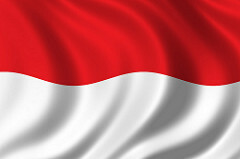 The movement follows in Tari Saman Aceh derived from Nanggroe Aceh Darussalam (NAD). The uniqueness of the dance of Aceh is raising its nimble, flexible, and lightweight. The movement follows the verses that are sing. Saman dance usually performed by teens or tens of men, but the amount must be odd. However, in its development of this dance is played by women. To do this dance, good cooperation is needed among the dancers. 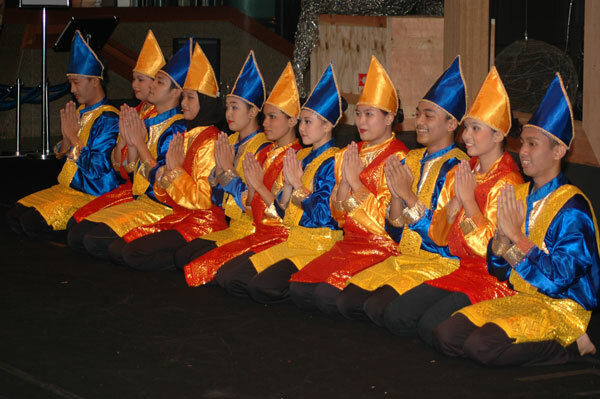 In General, Saman dance played by the 17 dancers with the following conditions. • Dancer number 9 is called Pengangkat. Pengangkat is the main character in the tari Saman. He determines the motion dance while singing the verses. • Number 8 and 10 Dancers called Pengapit. The figure Pengapits heip Pengangkat , either in motion or dance lyrics that are sing. • Dancer number 2-7 and 11-16 are called Penyepit. Penyepit is a regular dancer in favor of dance movements directed by the Pengangkat. • Number 1 and 17 Dancers called Penupang. Penupang is a dancer who is on the far ends of the left and right. In addition to functioning hold the integrity of the position of dance in order to keep closing and straight. 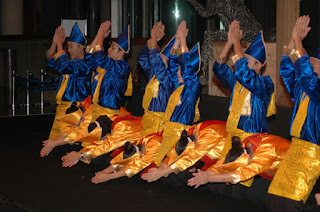 On the Saman dance, dancers sit kneeling position and depressed body weight on both feet. Saman dance space on pattern limited the height position of the body, from a sitting position kneeling turned to a position above the knee are called berlembuku. This movement is the highest level. As for the lowest level when the dancers bend forward 45◦ called tungkuk or while leaning back up dancers 60◦ called langat. There is also a Saman dance movements accompanied tilted to the left or to the right called singkeh. In addition, there is an exercise in sitting position pitch to rightforward or to the left-back called lingang. 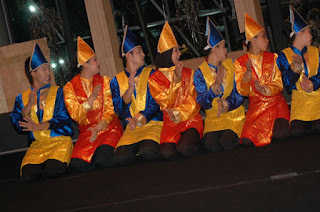 In the Saman dance, hand gestures are very dominant because it serves as a motion and music. Hand gestures in the dance of Saman among others as follows. • Cerkop is the movement of both closed hands and directional. • Cilok is the tip of the index finger as if to take a light objects such as salt. • Tepok, namely hand movements are done in a variety of positions, such as horizontal or propeller. called tungkuk or while leaning back up dancers 60O called langat. There is also a Saman dance movements accompanied tilted to the left or to the right called singkeh. In addition, there is an exercise in sitting position pitch to kanandepan or to the left-back called lingang. 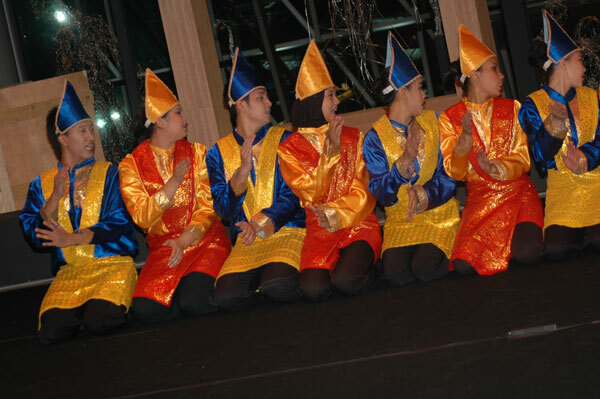 In the Saman dance, hand gestures are very dominant because it serves as a motion and music. Hand gestures in the dance Saman among others as follows. • Cerkop, i.e. the movement of both hands berhimpit and unidirectional. • Motion i.e. Cilok, the tip of the index finger as if to take a light objects such as salt. As for the motion of the head in the Saman dance is as follows. • Anguk, namely Chief as a nod in the tempo slow to fast. • Girek is the movement of the head spin like a propeller. Saman dance performed without music instruments. As for dance accompaniment Saman is the movement of the hands and the body of the dancer. Here are some ways to get the tempo sounds, moderate to fast. • Pats both hands, the usually moderate to fast up-tempo. • Pat both palms to the chest, usually up-tempo. • Pats one of the Palm of the hand to the chest, usually a moderate up-tempo. • Friction thumb with middle finger, usually a moderate up-tempo. In Saman dance shows, all the movements are combined to produce a beautiful dance. The power of Saman dance not only from the poem is done , but a compact movement also became more value in this dance. Tari saman had many names. Not only is dance a thousand hands, but also a Saman Gayo in Aceh and the Middle-East, Saman Lokop in East Aceh, and Saman Aceh Barat in West Aceh. Malay traditional dance originallyt from the region of Southeast Aceh in Gayo Highlands. The name "Saman" taken from the name of the creator and developer of the Saman dance of Sheikh Saman. He was one of the Ulama(scholars) who spread the religion of Islam in Aceh. That's why the poem or song that the Arabic language is used in the saman dance and Aceh. Usually, the poem used in saman dance contains the messages of dakwah(religious advice), satire, advice, and romance. 0 Response to "Tari Saman(dance with thousand hands)"